The Forum of Independent Human Rights Organizations strongly condemns the vicious repression by the Egyptian security apparatus of peaceful protestors on April 6 that turned Cairo into a military barracks. Protestors gathered to demand an end to the state of emergency in effect for the last 29 years, changes to the political rights law to guarantee the integrity and impartiality of the coming presidential and parliamentary elections, constitutional amendments that would enable competitive presidential elections among a variety of independent candidates, and term limits on the office of the presidency. According to reports, more than 100 people were arrested and many of them detained at Central Security Forces barracks. Several protestors were beaten and mistreated in the streets before being led to police vans by plainclothes security personnel who acted like a militia. Women and girls were beaten by women police officers for the first time, recalling the violence and sexual harassment that targeted both male and female demonstrators who protested against the amendment of Article 76 of the constitution in 2005. Journalists, reporters and photo crews with satellite channels were also assaulted. Their cameras and film were confiscated and they were prevented from doing their professional duty of covering police repression. The security services have sought to criminalize the right of citizens to peacefully assemble and protest by trumping up charges such as "participating in a demonstration to overthrow the regime," "participating in a group whose goal is to resist the basic principles upon which the regime is based, incite hatred against it, and show contempt for it," and other unfounded accusations. The Forum believes that the crackdown on protests on April 6 is a prominent link in a chain of repression that will likely grow in coming months. Aimed at securing the ruling party's monopoly on power, the repression will only increase as this year's parliamentary elections and next year's presidential elections approach. 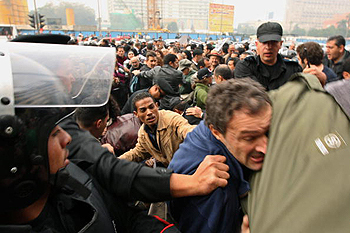 The authorities began preparing early, abolishing judicial supervision of elections in 2007, renewing the state of emergency when necessary, imposing further security restrictions on human rights groups, kidnapping and detaining bloggers, cracking down on all forms of peaceful political protest, and directing successive blows to the Muslim Brothers, Ayman Nour and his supporters. In the same context, we have seen assaults and arrests of several supporters of Dr. Mohamed ElBaradei, who has linked his candidacy in the presidential elections to specific constitutional reforms. Escalating the repression to close all platforms for peaceful expression, contain political action and cut off legitimate demands for electoral reform will undermine the integrity of the coming elections and threatens to throw the country into a spiral of violence that must be avoided. Preserving the credibility of the upcoming elections requires that the government and its institutions respect citizens' rights and the freedom of all political parties and groups to address them. There must be sufficient guarantees for the freedom of expression and peaceful assembly, and constitutional reforms must be undertaken that guarantee a reformed electoral system that upholds the right of Egyptians, like other civilized states, to choose their leaders through the ballot box in fair and free elections. These elections must provide equal opportunity to all competitors and allow all voters to cast their ballot freely without repression or the siege of polling stations, whether by police forces or organized or hired militias. This article was originally published by the Cairo Institute for Human Rights Studies: http://www.cihrs.org/english/.